Hobgoblins are huge, stupid goblins. They are born and bred to be warriors and just are not capable of much else. They find it difficult (if not impossible) to master the intricate rituals necessary to cast any but the most rudimentary spell or prayer. Although their dexterity is not necessarily in the ‘agile’ category, many a thief has put bread on the table with brute strength. 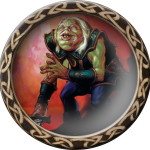 Hobgoblins are very resistant to poison and disease, but are vulnerable to sunlight. Also, Hobgoblins have very thick skin. They can also see in the dark.